Traditionally when one mentions investing in precious metals Gold is usually the first thing people think of. But let’s look at a number of reasons as to why Silver could be a better investment. The Gold-Silver Ratio (GSR) is calculated by dividing the price of gold by the price of silver. It measures how many silver ounces you can buy with one ounce of gold. The gold vs silver ratio is a very popular tool to compare the performance between gold vs. silver. When the ratio is moving higher, gold prices are stronger than silver prices. When the ratio is moving down, silver is outperforming gold. The current extraction rate of gold to silver is only 1:9 and whilst most gold remains available forever, silver’s heavy industrial use sees much of it ‘disappear’. In fact the US Geological Survey predicts at current consumption and extraction rates silver would become extinct within 7 years. This gives many investors reason to believe that a marked correction to the downside of the gold-silver ratio must occur sometime soon. In this century, since the Federal Reserve was created, there has been three occasions when the gold-silver ratio has been below 17 – 1919, 1968, and 1980. The gold-silver ratio is just one factor that you should look at. 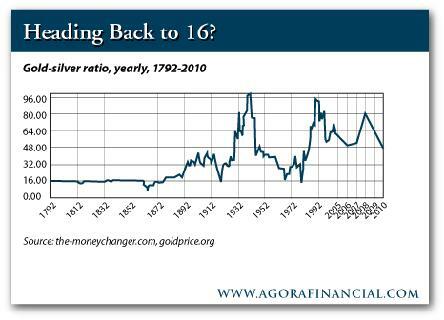 Below is gold silver ratio graph that compares the two metals back to the 1700’s. If the ratio returns to anywhere near 16 then that implies a much higher percentage gain in the Silver price over Gold. Below is a chart that is mirrored around the world, the Comex depository in New York City shows dramatically declining inventories since the 1990’s. This is due to a combination of increased investment demand (physical metal held by ‘strong hands’) and industrial use for this indispensable metal. 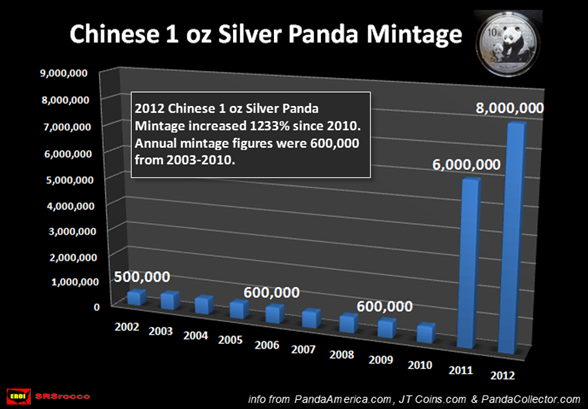 In China alone the mintage for 1oz Silver Pandas has exploded over 10 fold in just the last two years, Chinese citizens have only recently been given permission to own precious metals so this type of demand did not exist during the last bull market in the 1970’s. Consumption in India too has skyrocketed as the worlds largest private consumer of gold is aggressively turning to silver after the Indian Government moved to limit gold imports. Increasing demand and falling inventories should ultimately lead to one thing, dramatically higher prices. 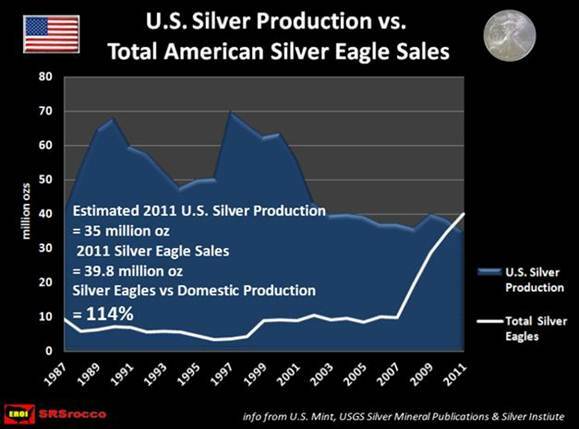 In 2011, for the first time ever the sale of US Silver Eagle coins exceeded US Silver production. The same thing occurred in Canada with the Silver Maple coins. Demand increased sharply since the global financial crisis in 2008. 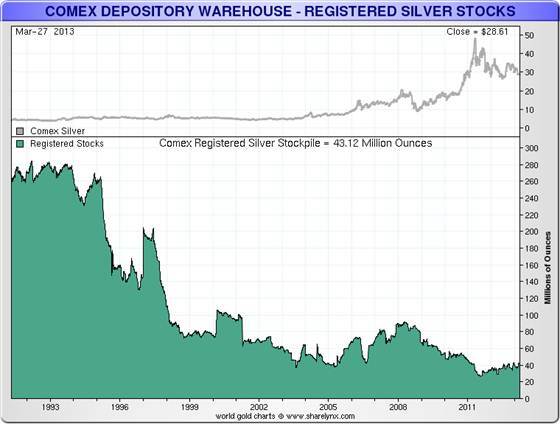 More recently in 2013 we saw all-time record breaking US Mint silver coin sales in Q1 2013. Canada also reported Silver and Gold Maple Leaf sales up 65% and 96% from Q1 2012. This was a combined weight of 20.8m oz while domestic mine supply was only 14.3m oz. 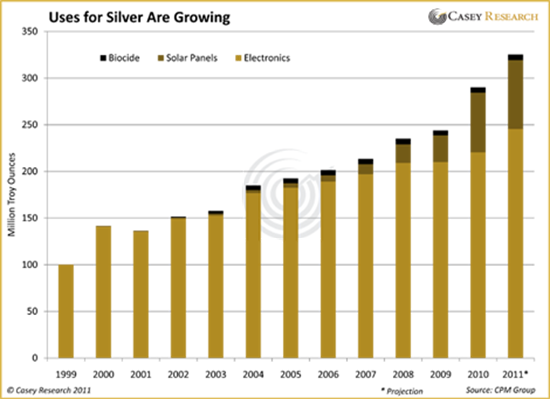 The top 6 Silver producers in the world have collectively increased their tonnages of ore processed and yet the average yield of Silver recovered continues to decline. This will further exacerbate the already tight supply levels. Most silver, 70-80% brought to market, is mined as a by-product of copper mining, gold mining, or zinc and lead mining. There are very few silver mines in the world, since most are really copper or gold mines. Therefore, mild increases in the price of silver will not bring substantially more silver out of the ground. Of all the elements, silver is the indispensable metal. It is the most electrically conductive, thermally conductive, and reflective. It also has unique anti-bacterial or biocideproperties. Some of its hundreds of applications include: Batteries, biocides, catalysts, electrical conductors, electroplating, jewellery, medical applications, mirror reflective coatings, photography, silverware, solar energy cells, soldering and water purification. Whilst the whole world is moving more to sustainable solar power, significantly the populous China has recently raised their target for solar power. This is an incredibly important event for the silver market. That means more silver demand. They have raised their target to more than 35 gigawatts by 2015, up 5 times from the current level of 7 gigawatts. China’s previous target was 21 gigawatts by 2015, so that’s a stunning increase of 67% above their previous target. All of this is going to require more physical silver. Photovoltaics already consumes 10% of the entire silver market, and we will see an enormous surge in that number over the next five years. There should be tremendous upward pressure on silver prices going forward because of China’s need to build out solar capacity. The price of Silver usually magnify the price change in Gold, it’s a smaller market and is prone to larger swings, both up and down. During the bull market of the 1970’s the Gold price increased around 24 times from start to finish, during that same timeframe silver increased 33 times. In the 10 years to the time of writing this page (2013), gold had risen by 200% compared to silver at 327%. Given the above fundamentals and its volatile nature, Silver appears not only incredibly undervalued as an essential metal but with far more potential for explosive price gains over the coming years than gold. For these reasons Silver should be a serious consideration in any investment portfolio.